It measures 3cm x 3cm and is made of four layers of glass. The first layer is made up of large stripes of Green, Mustard and Purple. Then a layer of strips of Pink, Green, Gold and Blue Dichroic glass. 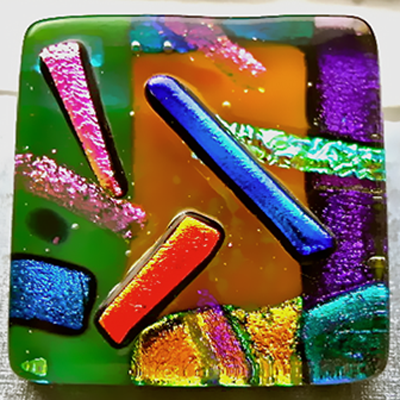 This is topped with a layer of clear glass and finally there are Blue, Pink and Orange strips of Dichroic glass on top. It has a very strong brooch pin and comes in a Black or Silver card gift box.